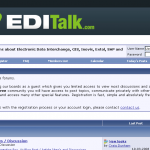 EDITalk.com is one of my side projects, and I’d figure I’d post about it here on my blog. 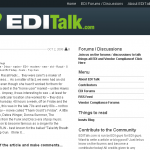 The EDI Talk Blog and Forums have gone through some major changes in the last week. We have invested in an amazing community software which includes forums / discussions, social groups, buddy lists, private messaging, user profiles, reputation system, and many other features. In roughly one week we are planning on launching the EDI Wiki, which will be a community driven wiki that will cover all aspects of EDI and EDI related documents.